Binoculars.com, one of the largest on-line optical retailers in the US have for a number of years been awarding their own annual binocular awards to their favorite binoculars in nine different categories that they have identified as being important to their customers and determined the year's best in each. Their Binocular of the Year awards are in their words: "designed to recognize the game changers, the innovators, and the standard-bearers of the optics industry every year. And, frankly, 2012 is a doozy." I am not sure if Binoculars.com have any marketing motive or manufacturer pressure behind the winners, but they say that to determine they put all the binoculars through a series of tests: They "play with them in the office" and they "take them out in the field." On top of this they look closely at their construction and far off through their lenses. Their in-house team of experts also put each pair of optics through a series of exacting tests to rate its performance in terms useful to their customers. 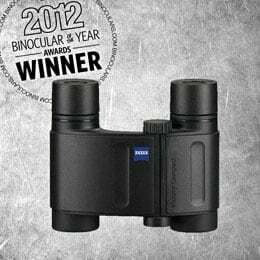 The results of the Binoculars.com's Binocular of the Year awards tend to come out pretty early in the year as opposed to the one I conduct on this site which come out towards the end of the year, giving me time to review as many new binoculars during the year as possible. What Binoculars.com say: "Back-to-Back Winner! 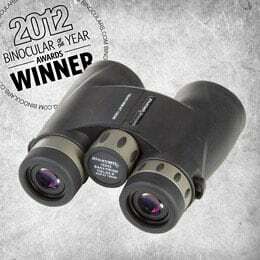 The Bushnell 10x42 Legend Ultra HD Binoculars were introduced in 2011, but remain a step ahead of the competition in 2012. Our Binocular of the Year provides a level of light transmission that's unmatched in its price category, making it a favorite for all kinds of use. With Bushnell's patented Ultra-Wide Custom Band Coating and ED glass lenses, the Legend Ultra HD collects a wider range of bright, accurate colors, especially at dawn and dusk. Bushnell knows the Legend Ultra HD is popular, so they've made sure not to skimp on features. These binoculars also get Rainguard HD coating, comfortably contoured grips and long eye relief, and an extra-wide field of view. Bushnell is so confident in their product that they offer to buy them back for a full year, for any reason ... but don't plan on it. 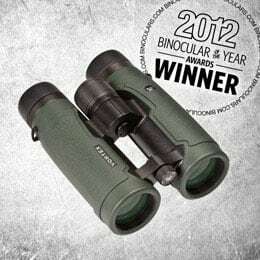 The Legend Ultra HD is here to stay, and we're proud to name it the 2012 Binoculars.com Binocular of the Year." What I say: Unfortunately I have not had the chance of reviewing these yet, but I must admit that their specifications do look pretty impressive and none more so than their field of view which is 340ft @ 1000 Yards which ranks them with some of the very best 10x42 binoculars on the market. 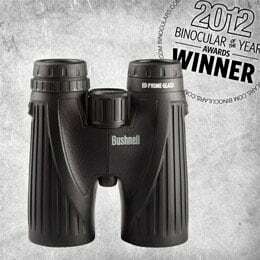 Bushnell have also used a whole host of quality optical components including extra low dispersion glass in the lenses. This ED glass gives the designer of a multi-element objective lens a wider range of options with which to control and minimise aberrations, in particular, chromatic aberration by concentrating and directing the light more effectively. 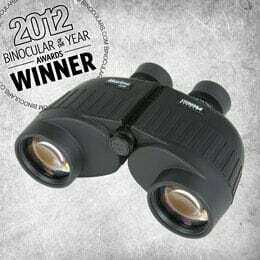 What Binoculars.com say: "3-Time Winner! Sometimes the best just can't be beat. Until someone invents the X-ray binocular, we can't foresee a pair topping the Swarovski 10x42 EL Binoculars as the cream of the crop. These ultra-high-end binoculars boast flawless High Definition Swarovision optics, optimized proprietary lens coatings, and incredible view-enhancing field-flattener lenses. The views are incredible, and the body's no slouch either - the EL series is known for being low-maintenance in a way that most luxury models aren't. 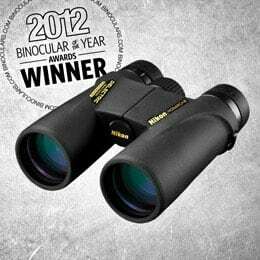 When you want the absolute best in binoculars - bar none - get Binoculars.com's 3-Year Best of the Best." What I say: I must say that once again I agree with Binoculars.com, If you are looking for one of the best binoculars that money can buy, then you wont go wrong with these Swarovski 10x42 EL Swarovisions. I really like their open bridge design and as you would expect with any pair of optics in this class, they use the best possible optical components and coatings to produce a view that can in some cases be matched, but never beaten. What Binoculars.com say: "Quick and light like the birds you seek, the Nikon 8x42 Monarch 3 Binoculars are all-new this year and better than ever. The enhanced optical system in these birding binoculars features EcoGlass lenses with phase-correction Silver-Alloy Prism multi-coatings. That means bright, accurate colors from dusk till dawn that allow you to make accurate identifications without worrying about your optics. The super-fast turn-and-slide multi-click rubber eyecups and lightweight body were designed with the birder in mind, too, ready to go from in-hand to in-focus in the flap of a wing." What I say: Just like Binocular.com's 2010 and their 2011 winner for the best birdwatching binocular, this years choice of the Nikon Monarch 3 8x42 is for me a rather strange choice. It is not that they are a bad binocular, far from it. The problem for me is their rather narrow field of view. At only 330ft wide at 1000 yards, it is less than the Bushnell Legend above and that has a 10x magnification! To be a really good birding binocular, I would be looking for something with a field of view nearer or even over 400ft wide at 1000 yards. Having said that, if a really wide field of view is not that important to you, they do look like a pretty good pair of optics, especially if you take into account their really competitive point. Quality features include: Fully Multi-Coated Lenses, Phase correction coatings on the Prisms and an incredible 24.1mm of eye relief that should really appeal to those who wear glasses. The 8x42 Nikon Monarch 3 Binoculars cost about $230 in the US. What Binoculars.com say: "The Zeiss Victory 8 x 20 Binoculars understand that oversized can easily overwhelm, and that's why this understated pair are our best compact binoculars for 2012. Weighing in at a scant 8 ounces, these 4-inch binoculars have an incredible close focus of 8.5 feet, a 350-foot field of view at 1,000 yards, and crystal-clear optics. All the advanced technology you'd expect for Zeiss is here, including FL Concept fluoride glass optical system, T* anti-reflective coating and P* phase correction, and LotuTec™ waterproof lens treatment. Zeiss couldn't have possibly done more with less, and we couldn't be more impressed." What I say: There is no doubt that if you are holding a pair of Zeiss binoculars, you have some premium high quality optics in your hands and these Zeiss Victory Compact Binoculars are no exception. Their unique off-center pivot ensure that when folded they are as compact as possible, even matching many duel hinge designed compacts making them an ideal travelling companion. For more on this, take a look at my article on the Best Compact Pocket Binoculars. 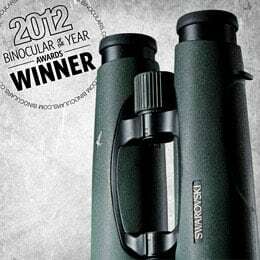 What Binoculars.com say: "Quick, smart, and tough ... like a hunter. We've named the Vortex 10 x 42 Talon HD Binoculars 2012's best hunting binoculars because they move and act like a predator in the field. The HD here stands for high-density ED glass multi-coated with Vortex XR anti-reflective formula that delivers accurate and high-resolution images every time. The Talon HD is rugged, too - the optics are argon-purged and O-ring sealed for total fog and water protection, the open-hinge design and ArmorTek body are designed for bumps and bruises, and they're easily tripod adaptable. 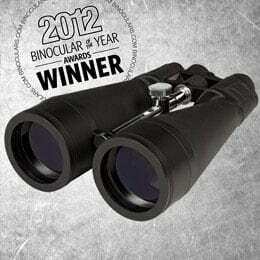 The hunt for binoculars is over, so your hunt can begin." What I say: Whilst I have not actually reviewed this pair of Vortex binoculars, the ones that I have looked at like the 8x42 Viper HD, really impressed me and these Talon HD's come with all the high quality optical components and coatings that you would expect to find on a pair of premium optics. For a binocular with a 10x magnification, they have a nice wide field of view, great minimum focusing distance (although I hope you wont be needing this on a hunt!) and a good amount of eye-relief. The tough open bridge design will help with your grip on them whist navigating through thick undergrowth and they are fully water and fogproof. Apart from protection from knocks and bumps, the ArmorTek covering makes the binocular less reflective. It will also dampen down any sounds, if say your watch or ring strikes against the barrel - these are important features if you want to remain unnoticed when tracking timid wildlife. The 10x42 Vortex 10x42 Talon HD Binoculars cost about $480 - $500 in the US. What Binoculars.com say: "Zhumell 20x80 SuperGiant Binoculars are designed specifically to put as much power as possible into a sub-$100 package. And they most certainly succeed - these massive astronomical binoculars are simply unparalleled in their class, and pace nicely with much more expensive models. Weighing in at just 4.4 pounds, these black beauties are small enough to use in the field, but of course are best mounted to a tripod. They feature crystal-clear views close and far via fully multi-coated optics and BaK4 prisms, and custom adjustment with center and right diopter focus knobs. Perfect for lunar viewing, locating deep space objects, or super-long range terrestrial viewing, these giant binoculars are sure to open more than a few eyes." What I say: These Zhumell 20x80's look to be an excellent and fairly inexpensive choice if you are after a binocular for astronomy but could also be used for long distance terrestrial observation. The very large 80mm objective lenses and the fact that they are fully multi-coated makes them ideal for astronomy use as they will not only gather much more light than ones with smaller lenses, but the anti-reflection coatings will ensure as much light as possible gets to your eyes. Zhumell SuperGiant 20x80 Binoculars cost about $100 in the US. What Binoculars.com say: "Steiner binoculars are revered for being both high-quality and high-value, and their service department offers nothing less. It's been another pleasurable year for Binoculars.com and our customers dealing with Steiner in all aspects of optics maintenance, replacement, and advice. Their binoculars rarely require service, but Steiner's comprehensive product warranties and always-there repair department and quick and efficient. You have to be able to count on your binoculars to work every time, and Steiner is there to make sure that they do." What I say: To be honest I have not had that many dealings with the guys at Steiner. I have spoken to a few of their guys at trade fairs an the like and they have always been very helpful - although they have not been that forthcoming in sending me samples to review - big hint to you guys at Steiner! What Binoculars.com say: "We get hundreds of customer reviews on the Zhumell 10x42 Short Barrel Waterproof Binoculars, but they all have two things to say: "great binoculars," and "great value." With the smallest possible body wrapped around high-quality 42mm objective lenses and a host of professional features, we hear about customers taking these specs everywhere! They weigh only 24 ounces, but pack nitrogen-purged multi-coated optics, a padded, grippy, waterproof exterior, and easy twist eyecups and focus that are perfect for birders, hunters, tourists, sports fans, and travelers. The Short Barrels have a short price tag, too, and a Zhumell 25-year no-fault warranty that's hard to beat. We can't wait for another year's worth of stories to come out of these popular binoculars." What I say: I have not reviewed these so can't comment on their actual performance but costing around $100, these 10x42 Zhumell Short Barrel Binoculars have a couple of good features: They are fully waterproof and fog proof and they come with fully multi-coated optics. However their field of view is not that great, nor is their eye-relief, but their minimum focusing distance is pretty good. For some other options, take a look and compare all the Low Cost Binoculars that I have reviewed. The 10x42 Zhumell Short Barrel Binoculars cost about $110 in the US.